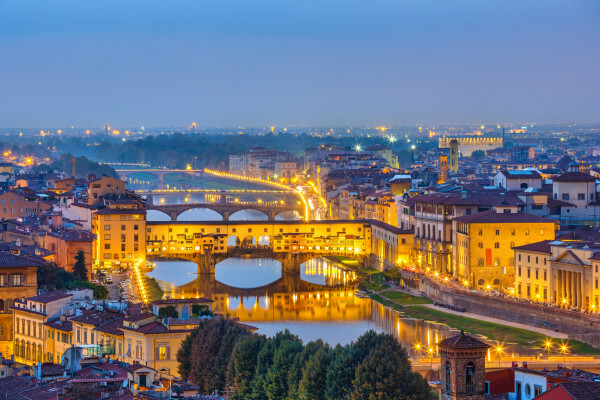 Florence is the capital city of Italy’s Tuscan region, and is known as the “cradle of the Renaissance” because of its monuments, churches and buildings. It has been a UNESCO World Heritage site since 1982, and is ranked by Forbes as one of the most beautiful cities in the world. Visitors to Florence will want to visit their most famous cathedral, Santa Maria del Fiori, or Il Duomo. Begun in 1296, and completed almost one hundred and fifty years later in 1436, the famed dome was engineered by famed Renaissance artist Filippo Brunelleschi. The Gothic interior s filled with artwork and tributes to many of the city’s most famed citizens, and the subterranean vaults have been used for the burial of Florentine bishops throughout the centuries. Italy is known for world-class food and drink, and Florence is situated in the heart of Italian wine country. Be sure to visit Panini Toscani, where you can choose from a vast selection of local meats and cheeses for your panini, and then pair it with one of the best wines in the world. For an authentic Florentine experience, this quant restaurant is not to be missed!